of course none of this is surprising and for the full professor graph I think it shows the important point that the lag has been nearly constant over the last 15 years, despite perceived gains in Salary …. Is there lag? Full professor pay is 74 out of 107. What would be an appropriate position for UO in this list of Very High Research Universities? My take-away is that admin is overpaid — 45 out of 107 when the UO has relatively small units compared to bigger universities. 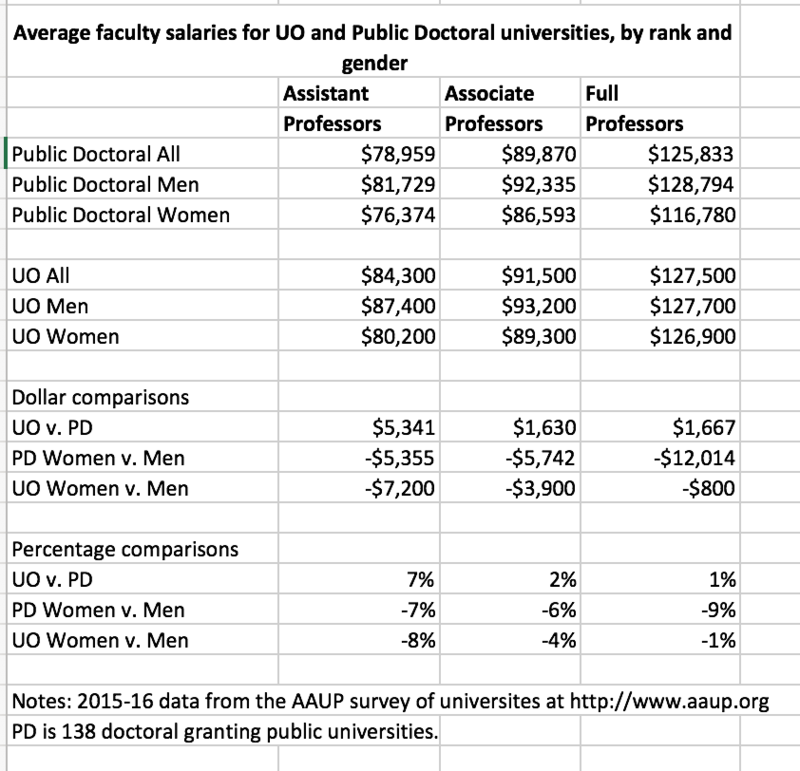 Glad to see not much salary difference between men and women at the full professor level. Just a bit higher than us on the list is UW and CU-Boulder. Should we be higher than them? The housing costs scores are twice as high in those places. Faculty may think they deserve higher salaries, but this list is not a strong reason on its own. I am sure there is a lag as the UO is reactionary – that indeed was the basis for the 2011 CAS (and other unit) raises. What does bother me is our consistent inability to catch up with any comparator sample we come up with. It is maybe a little non-aspirational to say our comparator set is the smaller, lower-reputation schools of the research active universities, but it is perhaps the most apt. I think we would look OK in that set. your asking for realism at the UO? …? “Not much salary difference between men and women at the full professor level”? In my department the difference between the average for men at that level and the average for women at that level is around $6000 per year, which looks to be about average for the university. I guess that’s “not much difference” if it’s in your favor. And maybe if you’re coming in at around $120,000, you can afford to say “Oh sure, let the guys have some extra thousands, I don’t mind.” When you’re making $77,000 as a full professor, seeing the guy in the next office making an extra $6000 for no discernable extra accomplishments sticks in the craw. As do people who are dimissive about it. $6000 is a lot. I was trying to see the graphs, and thought it was 1 or maybe 2 thousand, and then looked at the AAUP chart which said $127,700 for men compared to $126,900 for women, which was the basis for my comment. If the chart had supported your overall $6000 difference I hope I would not have reacted the same way. I thought the difference of $800 could be explained by lower ratios of women in the oldest (and presumably highest paid) faculty… but I admit I don’t know. Somewhere there are some departments where women are well- and equally paid — I wish they were at the UO and near me. In my department the top-paid male prof makes $20,000 a year more than the top-paid female prof, and $30,000 more than the second-top-paid female prof. Indeed the profs in the top 25% of salary are 90% men. Correlates with years at rank? Nope. Correlates with CV? Not that I can see. It always baffles me how these charts and averages never seem to reflect reality on the ground as I observe it. Well, glad to know the averages are working out somewhere. Doesn’t do much for morale over here though. I know, I was very surprised to see these results too. Where is that mysterious department where everything is flipped? The union is looking into gender equity and external equity, and I think UO has hired a consulting firm. I’ll post more if I learn more. I can think of one dept in the sciences where there is a female full professor that makes $50-100k more than the other full professors, and there are not many women in the department, so that whole department could look “flipped” even if it is mostly an outlier effect. She could raise the average for female full professors campus-wide by $100s alone! Are we going to measure equity in all of its forms? For instance the likelihood that a spouse gets a subsidized position at the university? Is that included in equity? Are we going to measure the extent to which differences in pay across gender are driven by outside offers/retention raises or differential attrition rates? Do they get the same counter-offers? Do they exit at similar rates? Or are we going to focus on just whether men and women get the same salaries? Re: the difference between IPEDS and AAUP. IPEDS collects data on full time instructional staff only (i.e. any faculty whose job description includes some instructional duties, not just those who are 100% teaching), while AAUP data includes full time and part time instructional, research, and service faculty. Neither survey includes medical school salaries. I like these graphs and for my next statement am I defending gender wage differnce, however I cant help but want to remove some of the variables. Each person is different and the closest I could hope for is a direct comparison job for job. Is there more people of one gender in a particular area (like math or marine biology) verses another? what is the split in these departments? Are these positions being compared bachelors to doctorates? I know in the position my friend has at the UO the wage can vary widely based on qualifications. I think if they are comparing full professor to full professor the qualifications will be pretty similar. So UO managers averaged 33% raises while office staff averaged 6% raises over two years. I guess that’s what Schill means by budget realignment. These OA and staff numbers predate Schill. That said I’m guessing the trends will continue. 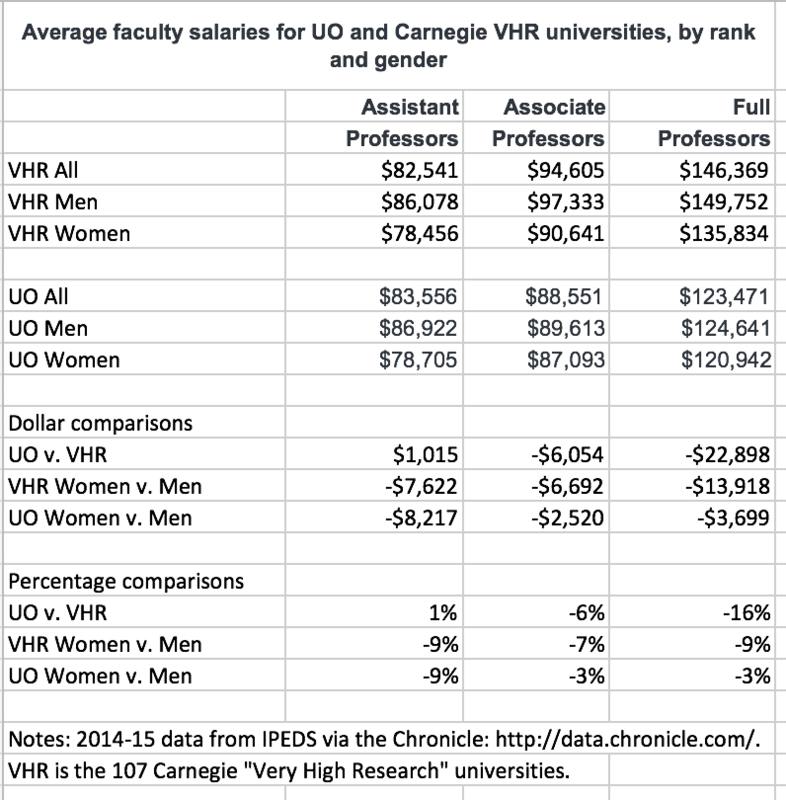 I remember the top administration of UO, including the VPFA complaining about any salary increases for faculty. Coltrane proposed a big 0 for faculty last spring year. How do top administrators think any of their lofty promises for the UO will work with this blatant disrespect to faculty and failure to budget for serious investment in faculty? Let’s see, faculty remuneration is going backwards compared to any decent set of comparator institutions. Same for the pay of OAs, classified staff and GTFs. 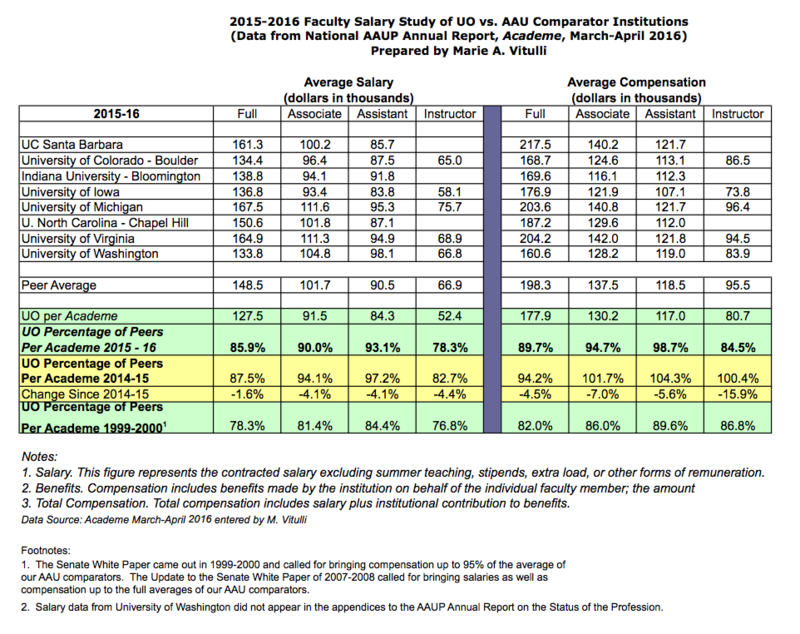 Only group that has seen a pay raise against the same comparators have been our administrators and in particular the upper echelon, i.e., Johnson Hall and Deans’ offices. Plus a massive increase in numbers of mid-level administrators, nearly all of whom take home more than most faculty and certainly much more than other university employees. This is not a new trend – it started in 1990 with Ballot Measure 5 and has continued unabated for 25+ yrs. Every couple of years we hear the same refrain – “we are going to pay you more” followed by “well, we would like to pay you more but [fill in the blank]” e.g., declining state allocation, current budget crisis, tuition too low, too few out-of-state students, resources previously allocated elsewhere etc. However funds are ALWAYS found to increase administrators’ salaries, perks and office staff as well as pet projects. Our new Board of Trustees talk a good game but in the end have done nothing. The faculty union, for all their promises, have sadly had little positive effect either on salaries or academic quality. Ditto for the Senate which was never very strong but was certainly stronger than the current version, which bends to nearly every administrative initiative. I don’t see any of these groups taking any initiative to improve our quality or raise salaries to comparator levels despite their annual promises. It is therefore left to the employees of this once fine university to save it from disaster. What to do? 1) Insist that students comes first in all decisions at the departmental, College/School and University levels; 2) Stop accepting all administrative initiatives as done deals; fight the ones that go against our values e.g., UO Police Dept shenanigans, the EMU renovation debacle, the cluster hires at the expense of people’s jobs, the yearly complaint that UO does not have sufficient funds to fund X, Y or Z depts, cuts in staff and GTFs, sweeping athletic dept scandals under the rug etc; 3) Insist that the Senate and Faculty Union put all their focus on academic quality issues (salaries IS an academic quality issue); 4) Talk to colleagues outside your dept and school to learn about their issues in order to avoid faculty in-fighting (the administration’s best friend); and 5) Give others on campus the benefit of the doubt. Everyone is working incredibly hard to stay afloat. Stop whinging and start showing respect across campus. If we actually trust each other, we will work together to improve this place. The alternative? Well, you are seeing it happen in real time and it ain’t pretty. You and I have been reading different pay stubs, Sun Tzu. And yes, I’m a tenured full professor. 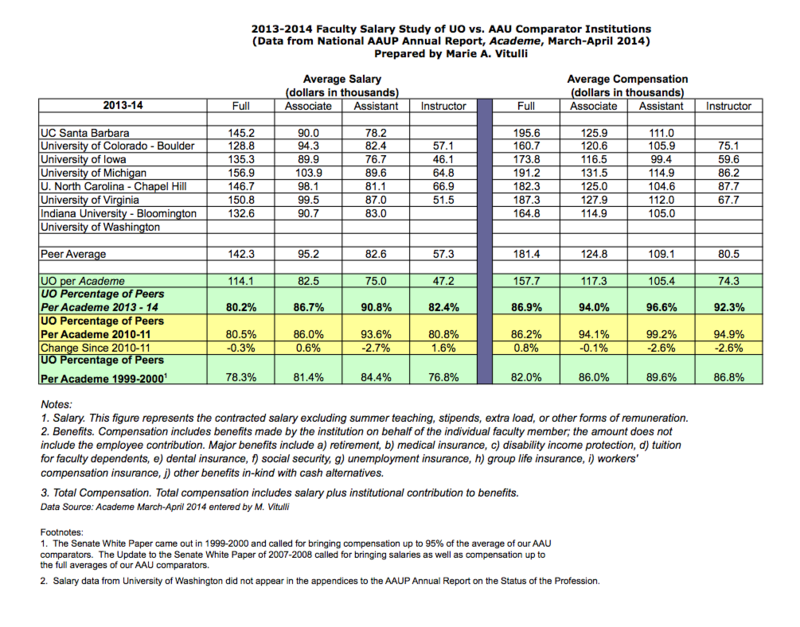 The difference between faculty compensation in 2012 and 2016 is enormous. Okay, I calculated the percentage increase of my paycheck from October 2014 to now. Yep! 1.9%! Someone probably got those big raises — haven’t seen them in my paycheck. subject to a non-standard raise. Perceptions of the impact of the Union vary all over the place – its always good to ground those perceptions in numerical reality over some appropriate time span. The UO, instead of adding another % to our base this year would only budge with a one-time cash payment, which the union negotiated up to $650. So the UO might have moved us closer instead of further from our comparators if they had listened to the wisdom of union negotiators. But everyone did get a one time prorated payment too. As for you comment Anony, I think Polyanna was referring to the cumulative increase in pay since the 2012 (see comment from michael below). And I suppose you are with Sun Tzu in thinking we would somehow be better off if we didn’t get the union negotiated average of ~13% over the last 3 years? And the future raises too? My salary has now increased by 24% since 2012. That includes an 8% review raise. My colleagues got similar raises except for one dead tree. Still well below faculty I know at other universities, but a big improvement. It’s hard not to give the union some credit. Damn I hate admitting that. I have a card I’d like you to sign. Since the first union contract in 2012, every faculty member at UO has received raises and will continue to receive raises, averaging (without promotion raises) about 20% over 5 years. Tell me the union has not made a difference and I have bridge to sell you. And this has been done at a time when the UO administration has clamored incessantly and relentlessly that the well is dry (and after massive decline in state support, 2009-2013). As we speak, our union is building a case for external and internal equity money in the years ahead. Just because other top-notch AAU campuses appear to have offered bigger raises this year does not mean they they will match or exceed our 3% (plus promotions) next year and the year after. There is clearly a need to do more, which is why I see a good case for getting involved in our union and help assure that we get to 95%-100% mean of our comparators in our next contract. Sitting back and complaining that ‘the unon’ did not get enough this year will do what? At the full prof level, the pay gap has been maintained despite this difference. I don’t think anyone is blaming the union for that. I think they are reinforcing that this persistent gap exists. As a consequence, the probability of achieving “more” is low, in my view.